Writing my encomium to Ray Bradbury, I noted that one of the authors I’d still like to be re-reading in the twilight of my life is Isaac Asimov. I wasn’t joking about it either. It is my personal belief that Asimov, along with Robert Heinlein and a select few others like Arthur C. Clarke, is primarily responsible for the development of what might be termed “hard” science fiction in the first half of the 20th century: he wrote primarily for John W. Campbell jr, who edited Astounding Science Fiction, and who liked plots where engineers dealt with the future in matter of fact ways quite different from stories featuring ray guns and Buck Rogers which dominated the field to that point. And, to Asimov’s credit, a subset of sci-fi is, in concept and execution, perhaps more completely his than any other writer: that of the robots. The replicants of “Blade Runner,” our complete identification with the laws of robotics, and even kiddie movies like “The Iron Giant” are his progeny and testament to the lasting influence of his ideas. Others had, of course, written about mankind’s mechanical creations before he did: the Jewish legend of the golem is one example, and the Frankenstein monster is perhaps the most famous (though the unnamed monster is not mechanical, and the concept preceded the actual word ‘robot’ by more than half a century); and Fritz Lang’s “Metropolis” (1927) showed us Maria, the female robot. But Asimov noted that he felt dissatisfied with the way robots were handled in fiction and emergent sci-fi of the day – either robots were threats to humanity or objects of pathos and pity. As a scientist himself, he approached the situation with more logic and posited robots created by practical people, with practical safeguards to ensure no loss of control. Hence the famous Three Laws of Robotics, the foundation upon which all of Asimov’s robot stories rested. 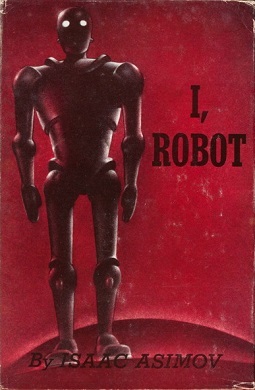 The main body of the robot short stories is in two collections: “I, Robot,” (1950) contained nine stories written for the American magazines Super Science Stories and Astounding Science Fiction between 1940 and 1950, and another eight were published in 1964 in “The Rest of the Robots.” Several novels and other stories were written after this, most particularly about the detective Elijah Bailey and his robot partner R. Daneel Olivaw (later merged into the “Empire” and then the “Foundation” series), but the core concepts and philosophical underpinnings of the entire genre were nailed down in the original seventeen stories. Thematically, all the stories share a certain similarity: they deal with how the self-awareness and complex behaviours of the robots is both guided and hamstrung by the Three Laws, and how seemingly illogical behavior of a complicated product of engineering is in fact logical in the extreme, in ways unforeseen by the creators. In fact, the stories more resemble detective fiction than anything else, and indeed, they trended that way as time went on. Initially the troubleshooters Donovan and Powell were the prime chracters, but with the evolution of Susn Calvin as the chief “robopsychologist” of US Robots, she took front and centre until Elijah Bailey came on the scene in later novels. Part of reading all these stories at once – they exist in an omnibus called “The Complete Robot” which I don’t recommend since it leaves out the interplay between a journalist and Susan Calvin that tied all the narratives together in “I, Robot” – is the fascination of observing how the evolution of robots is so clearly seen and logically, consistently developed: from the giant slaves of “Runaround” to the sleek humanistic marvel of Daneel and the robots of Aurora. And Asimov was sufficiently in command of his material to explore as many aspects of robot mentality and action as he could: jealousy, religion, humour, ethics, love, and grander themes of history and the sweep of human development. For sure, Asimov couldn’t quite get away from robots-as-threat or robots-as-pathos style entirely, but to his credit he kept it to a minimum. In the end, his robots are benevolent, occupied with the care and protection of humans, and evolve into god-like beings who try to ensure the well-being of humanity. Isaac Asimov is one the the great founders of modern science fiction, and is famous for not only the robot short stories, but for the “Foundation” and “Empire” series of novels, many tens of tomes on practical science (“How to Use a Slide Rule” is in my library as a perennially unread book), essays on science, literature and historical matters and many other collections of short stories. But even in his sci-fi writing he’s a tough act to pin down because of his brilliant and imaginative forays within the genre: “The Ugly Little Boy,” The Bicentennial Man,” “Nightfall” and “The Final Question” are four good examples of this, though only the second is a robot story (it was made into a much-lesser film of the same name). There is no precise analogue to robots in fictional historical antecedents – people knowledgeable of my mindset know that I believe many of our popular stories (in literature, radio, stage or film) have origins and roots in far older archetypes, all the way back to old tales told by the firesides of hunter-gatherers long dead. No such concordance is available for robot short stories unless it is this: they speak to man’s desire to make a being in the image of himself, to seek the sublime grace of becoming a Creator. Arrogant this may be, shortsighted, vain and even practically beyond our science. Asimov’s stories, short, taut and holding up well even today, pointed the way to a better understanding of the issues involved in our attempts to become Gods ourselves. Note the resemblance of the Iron Giant (from the movie) to the first edition cover. Not sure that’s a coincidence.